From the Big Bang 13.5 billion years ago to the appearance of the first organisms 3.8 billion years ago to us sitting checking Facebook in the present day, Harari relates the history of our species. He broadly breaks this down into three stages, the Cognitive Revolution (70,000 years ago, when we got rid ouf our cousins Homo rudolfensis, Homo erectus and Homo neanderthalensis) and evolved language and ways of communicating ideas that enabled us to cooperate as large groups. We also finished off the woolly mammoths and caused a mass extinction of early animal life (did you know that Australia was once home to large marsupial lions? Well it was, until we arrived). During the Agricultural Revolution (12,000 years ago) we learned to domesticate animals and cultivate grain, and finally there was the Scientific Revolution (500 years ago), which was characterised by an intellectual shift: the realisation that we humans didn't actually know everything. 'Modern-day science is a unique tradition of knowledge, inasmuch as it openly admits collective ignorance...' Harari writes. 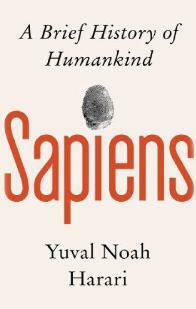 The book concludes with an analysis of how we might define and measure human happiness, and an examination of what might lie in the future for Homo Sapiens. We were fascinated, entertained and depressed in equal measure by this stimulating book. 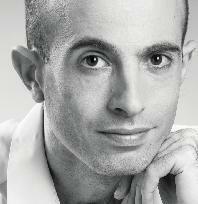 Everyone was impressed by Harari's ability to put big ideas into a few words and examples were vivid and helpful. We were delighted to discover that gossip, far from being an indulgent waste of time, has actually been a fundamental tool in the development of our species (if you know that X is having an affair with Y, you might be less likely to trust her when it comes to lending her money, for example). So no more guilty moments by the watercooler rehashing the office party. There is a detached quality to Harari's writing that adds to the sense of clarity and purpose in the text. The book was originally written in Hebrew, and there is perhaps something of a translated quality to the English text that enhances rather than detracts from it. One comment of ours was that it seemed to have been written by someone who practices mindfulness, and the sections on Buddhism (the only religion Harari really seems to have any time for) seemed to support this. It's hard not to feel depressed and shamed by the general catalogue of atrocity detailed here. From the knowledge that we are merely vehicles carrying DNA with a biological imperitive to multiply and spread, to the devastation we have wreaked on all other living creatures on the planet (from whales to farm animals – pity the battery farmed chicken), animals that we have good evidence to suggest have thoughts and feelings not wholly unlike our own. We justify all this on the grounds that we, homo sapiens, are the superior animal and therefore we must survive. This book overturns that assumption and it's hard to reconcile that with life as we know it. Yet Harari is not making judgements, he is merely setting everything out in order that we might better understand. 'We study history not to know the future but to widen our horizons, to understand that our present situation is neither natural nor inevitable, and that we consequently have many more possibilities before us than we imagine.' To alleviate any gloom we might be feeling at the current state of affairs he offers a brief digression into happiness and how such a thing might be measured. The future furthermore seems bright as scientific advancements mean human technology might yet vanquish death (the Gilgamesh project). After reading Sapiens, however, you are unlikely to view this as a good thing. A stimulating and insightful read that provided food for much discussion and further thought. At 400 pages the text is long, but in no way hard to read. Enjoyable, entertaining, beautifully written, and highly recommended. 'what the f**k' moment for me. I was learning and then passing on what I'd learned, there were so many read-out-loud moments. My only hesitation was that I didn't feel I knew enough to rebut any of his arguments. A book that shows the big picture, and I thought this was brilliantly done. I loved the mix of biological history with cultural. Seen in these terms we are simply another animal, albeit one that has evolved incredibly fast. I liked it when he connected familar bits of knowledge and suddenly put them into context of the full story, it was thrilling. There are biases and flaws and things to take issue with but generally a brilliantly sustained and quotable piece of writing. I loved the scale of his thinking and perspective. I think he's a genius – it's hard to think of a book that covers that much ground and is so well written. It's insanely ambitious but he pulls it off. Amazing. Not sure I can give non-fiction a five – my own personal bias – but I thought he was a very good writer and that this was very interesting. Overall, though, I did find it depressing and I had to skip over a large chunk and move to the end. It's hard to come to terms with the knowledge that we are, and always have been, little better than parasites. I didn't expect to enjoy this as much as I did. I found it very creative in its style and the author helped me visualise everything incredibly clearly. I did find it scary and sometimes heartbreaking. It left me feeling I want to somehow change things, to do something, but it's hard to know what. Fascinating and an unexpected delight to read. A masterclass in clarity and persuasive argument and yet at the same time a philosophical enquiry shot through with wisdom and humour. How can we justify our existence given the creatures we have evolved into, so wonderful and yet terrible? Perhaps we can't, but we can at least know the truth about ourselves and maybe make wiser decisions as a result. A self-help book for the species.